Find a Sightseeing trip that explores Balkans. There are 103 tours to choose from, that range in length from 2 days up to 20 days. The most popular month for these tours is September, which has the most tour departures. "Trip review Considering the places we visited, it was an ambitious one. I believe..."
"Took the Eastern capitals and Dalmatian Riviera tour with Insight Vacations from..."
"We had a great tour of the Balkans. 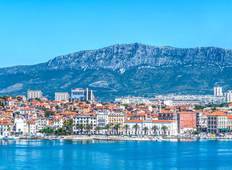 Our tour included Montenegro, Albania, Prizren..."
"We were in the Balkans for about two weeks so we wanted to learn more about the country’s..."
"Overall excellent. Very nice group of people, without exception, who were fun to..."
"Currently on this tour. While we have had a great time there have been some issues..."